He told talkRADIO: “The last time I’d seen a storm like that was in 1992 in New Orleans around this time of year as I was being evacuated from a hurricane. 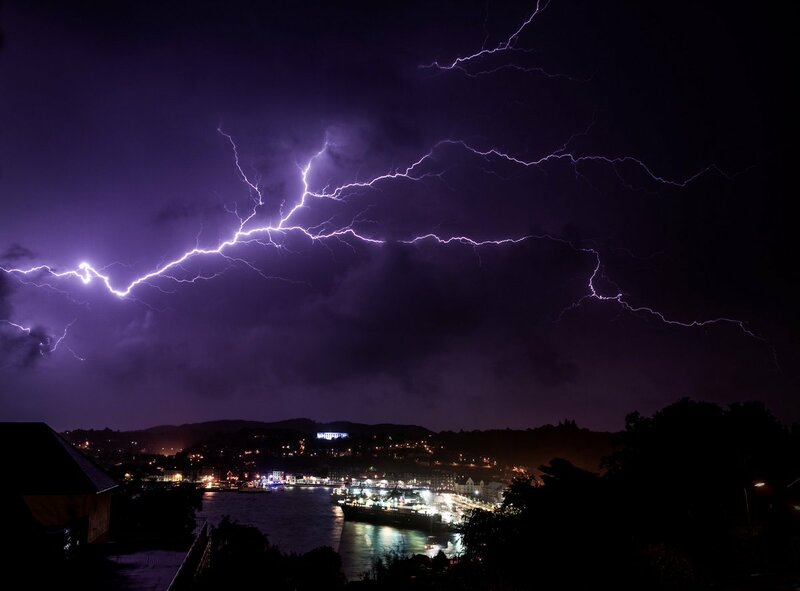 Nick had gone out in the storm on Tuesday night to take photographs of the lightning, because he had never been able to “get a good image” of it before. He said: “Normally I am going out chasing the Aurora and the Milkyway, and lightning is one of those things that I had never been able to get a good image of before so it was something I was quite excited about. “It is a shame really because I think if I had had a wider lens then you would have had even more of the lightning. “But, it was one of the situations where I just had to grab my camera and the first lens that came to hand. Talking about the weather itself, he said that “the heavens opened” and there were “big forks going right across the sky”. He added: “It was only really heavy rain for about an hour and then it cleared out – it was almost quite nice. “Then you just heard this thunder and you look outside and there is this thunder and lightning. It lit up the whole sky. “The heavens opened and it was chucking it down and this storm came over and it was really really incredible watching it. “The lightning was lighting up the clouds and it was really fork lightning as well which you don’t really get to see very often. Nick said: “We have had a lot of wind and rain but I think we have missed the worst of it. I think it is slightly further south that have really caught the brunt of it. “That being said, looking outside now and further out to sea – it is really rough out there. This comes as two people have been killed by the storm in Ireland, including a woman whose caravan was blown off a cliff in the west of Ireland. A man in his twenties was also killed in Northern Ireland when he was hit by a falling tree. Another man was left injured from the incident.